Fresh/edible: Szechaun flowers/Buzz buttons-Bullseye variety-60- fresh flowers. 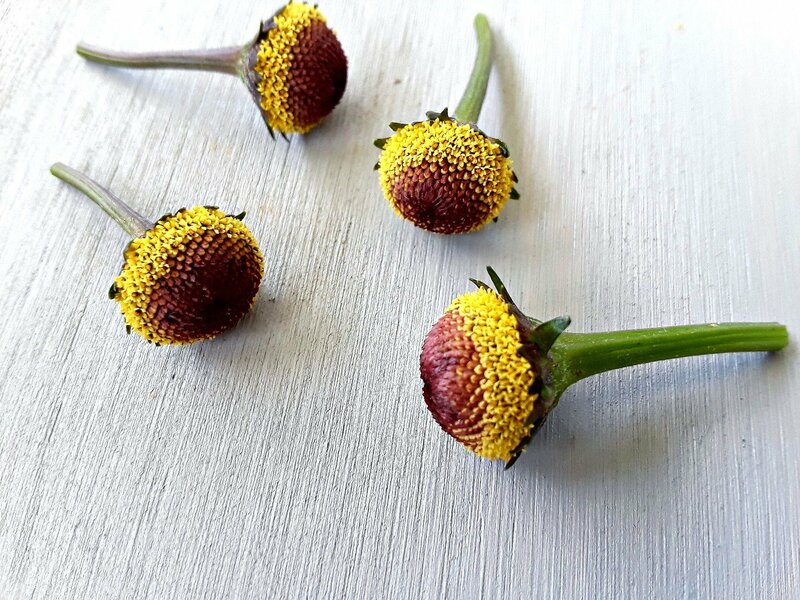 Szechuan Buttons (aka Sechuan Buttons, Sichuan Buttons, Buzz Buttons, Toothache plant, Acmella Oleracea) are an unusual food in that their primary use is not nutrition or flavor but rather to impart a sensation to food and drink. They possess a slightly bitter, herby flavor that isn’t unusual, but a few seconds after consuming them something very interesting begins to happen in the mouth: Eating a Szechuan button will lead to a tingling sensation…almost like mild voltage or bubbles from an effervescent beverage popping on the tongue. It is similar to (but much more intense than) the tingling imparted by Szechuan peppercorns, which is how this flower gets its name. Part of the secret of this effect may be that these flowers contain a natural painkiller sometimes used to numb toothache (hence their other nickname: toothache plant). It is not unpleasant, but surprising, and sharing just a small button with friends will cause a look of confused wonder. These plants have been grown by Natural Nomad Farms without the use of pesticides or chemicals. Picked fresh to order! ***We recommend you try a small piece to see if you can tolerate more, some people only need a small amount to reach the desired sensation. *** Disclaimer: This product is not intended to diagnose, treat, cure, or prevent any disease. Consume/use at your own risk.